I have experienced a wide array of work environments, ranging from awesome to awful. These experiences have taught me that the type of work environment I’m in directly impacts both my personal and professional life. When looking for a company to work for, it’s not all about salary and vacation time anymore. People want to know about the culture, the opportunities for upward mobility, and the education and training made available to employees. People want to know which companies are the best places to work and what makes them great. Now I know what makes a company a great place to work because I’m part of an organization that has been recognized for two consecutive years as one of the “Best Places To Work” in Arizona. I work at StringCan Interactive, a micro-sized (less than 50 employees) digital marketing agency in Scottsdale, Arizona and I’m proud to say, “I love my job." I’m not talking about the superficial cultures that have become increasingly popular and are defined by having Ping-Pong tables and kegs. A truly strong culture offers mutual support, promotes trust, rewards employees’ efforts, and ensures that employees know their work is meaningful. Instead of growing employees' skills to match the companies needs, great companies look for ways to grow the company based on employees’ passions. They continually ask employees what they are interested in doing and how they would like to see their career unfold. Since we spend so much time with our co-workers, it’s important to like and respect them. Working with people who are supportive and understanding fosters personal connections and professional growth. People inherently want to be challenged so they can continually grow and learn new skills. Great companies expect their employees to rise to challenges and be completely engaged. 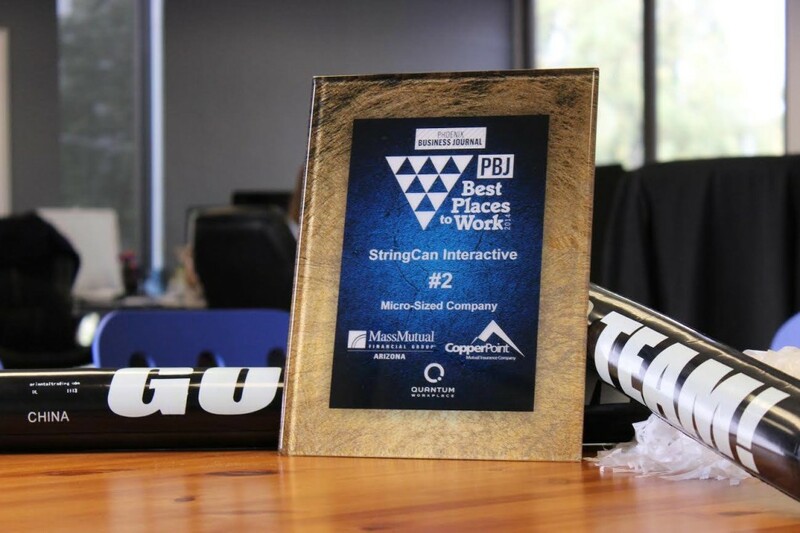 StringCan Interactive has all four of the key elements to look for in a great company. If you want to learn more, check out our next blog, “New Year’s resolutions from our fellow ‘Best Places to Work’ award winners,” to get helpful hints on how to have a great culture in 2015. What makes your company a great place to work? Comment below. Featured Photo, Phoenix. StringCan Interactive. 2014.